Welcome to Week 29 of the One Yard Wonders Sew Along! Tracy chose Valori Wells Wrenly Ingrid Gypsy and Valori Wells Wrenly Wildfield Gypsy. 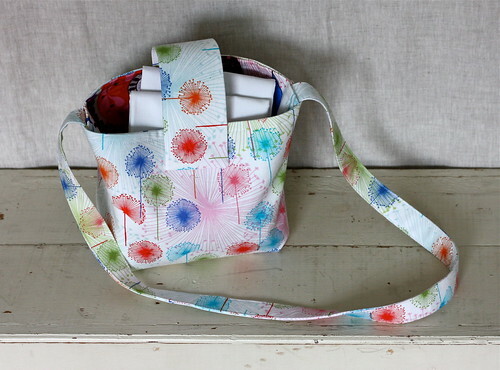 The Petite Diaper Tote is a useful, fun project that will make a nice baby shower gift. The instructions are clear and well written. A very cleverly designed pattern. The size seems just right for a few diapers, some wipes, and other necessities when a big diaper bag isn’t needed. Tracy used quilting weight cottons instead of a home decor weight as recommended. 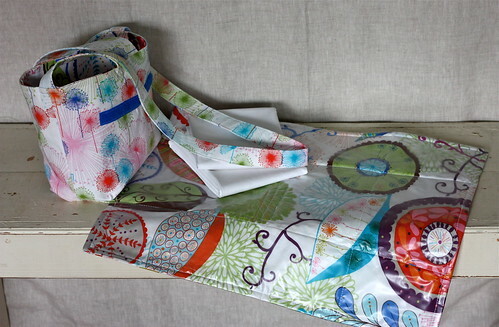 She interfaced both the lining and the exterior of the bag. 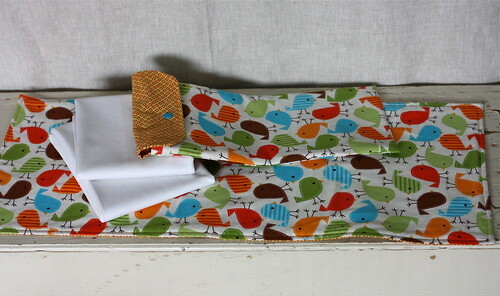 The pattern calls for 2 layers of fusible fleece on the changing pad. Tracy used one layer of fleece and a top layer of vinyl for easy cleaning. Next time Tracy may sew with one layer of fleece and a laminated cotton for a wipeable top of the pad. 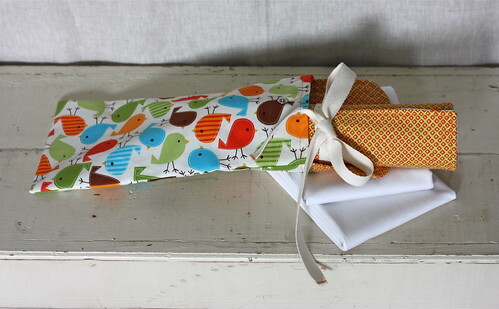 Carrie selected Ann Kelle Urban Zoologie Birds Bermuda and Michael Miller Fabrics Mini Mikes Dot N’ Square Tangerine. A simple and quick project. Beginning to end in just over an hour. 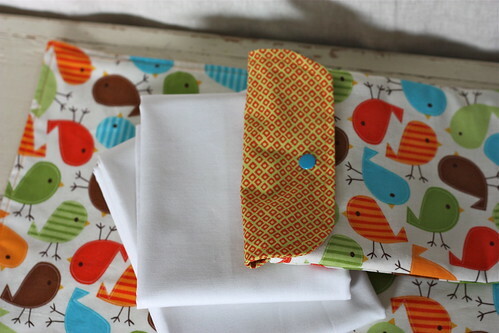 A decorative stitch or piecing the top would be a fun way to embellish the changing pad. Carrie likes Tracy’s idea of using a laminated fabric for easy cleaning.